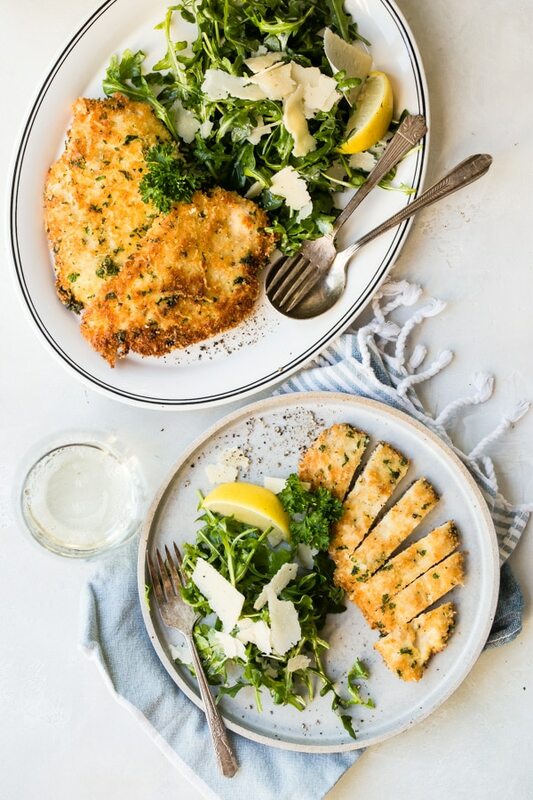 Who can resist Chicken Milanese, a crispy chicken cutlet topped with a bright and lemony arugula salad and ribbons of Parmesan cheese? Young, old, and everyone in between gobble up this recipe, and for good reason: it’s universally adored. A simple breaded and fried chicken cutlet spans many different cultures. There’s katsu, milanesa, schnitzel, and Wendy’s spicy chicken sandwich, to name just a few. 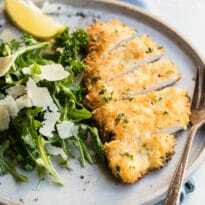 This Chicken Milanese recipe is the Italian version, and it’s so easy and fabulous. The chicken is pounded thin so it cooks in minutes, and I use panko breadcrumbs for extra crisp chicken. Make lemon Chicken Milanese with arugula and tomatoes, if you have ripe heirlooms. 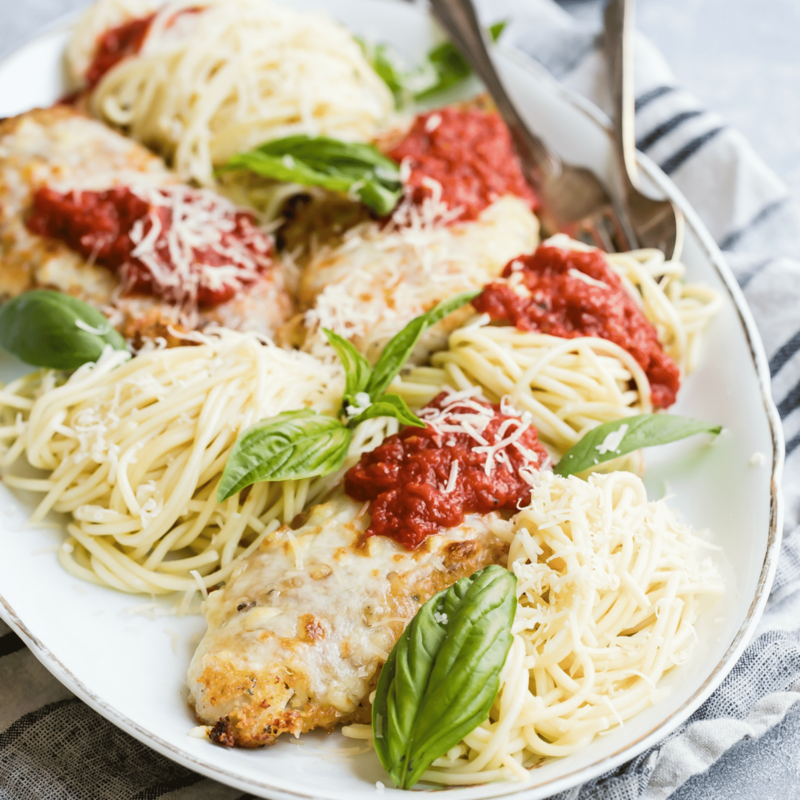 Or serve Chicken Milanese over spaghetti or angel hair pasta, of you’re feeling extra Italian. 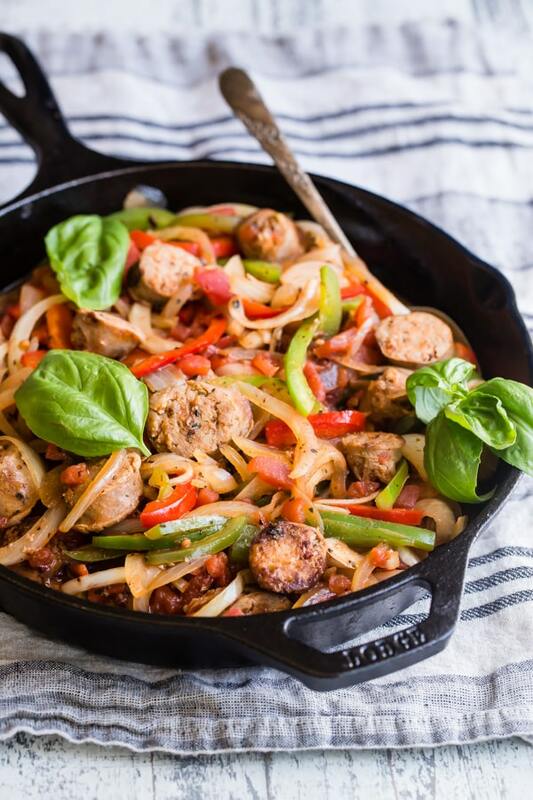 This is one of the best kid-friendly meals to make for the whole family too. 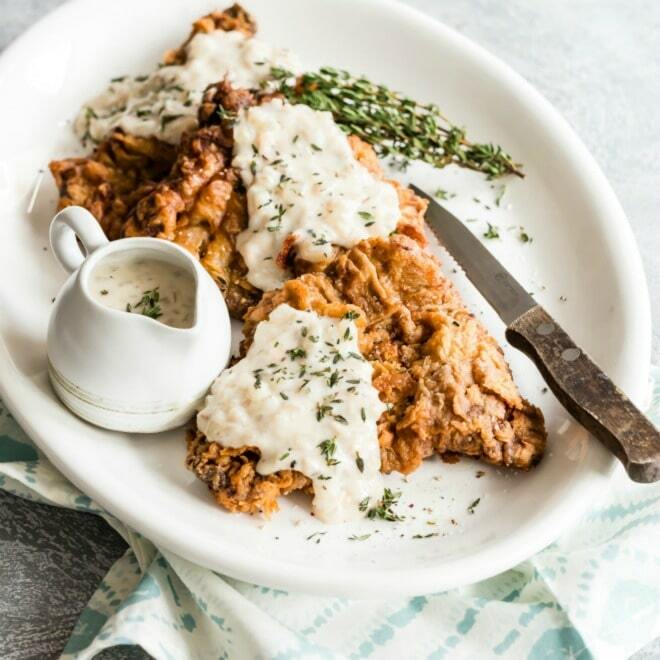 In case your little ones exist on a steady diet of dinosaur-shaped chicken tenders, you might want to give Milanese style chicken a try. No matter who you’re cooking for, this is one recipe you’ll never tire of, no matter how often you make it—and yes, I speak from experience. Just look at this! 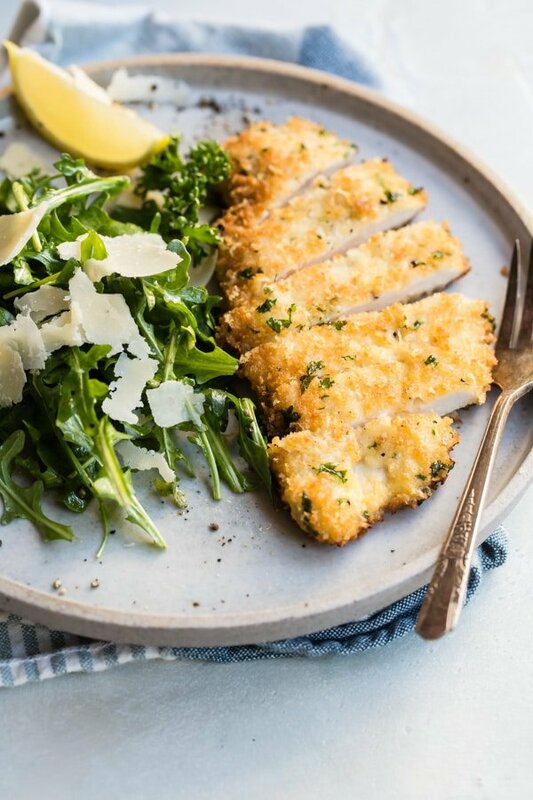 Needing Chicken Milanese for the whole group? Click and slide the number next to “servings” on the recipe card below to adjust the ingredients to match how many you’re feeding—the recipe does the math for you, it’s that easy. The best Chicken Milanese description I can give you is this: a pan-fried chicken cutlet, that’s been dredged in seasoned Parmesan cheese breadcrumbs and served with lemon wedges and a light salad. The term Milanese, from Milan, originally applied to veal, which has fallen out of popularity. True Italians will be quick to point out that Milanese is fried in butter, but I figured olive oil would be nice, too. By all means, use butter if you want. I know it would be divine. But keep the lemon wedges! 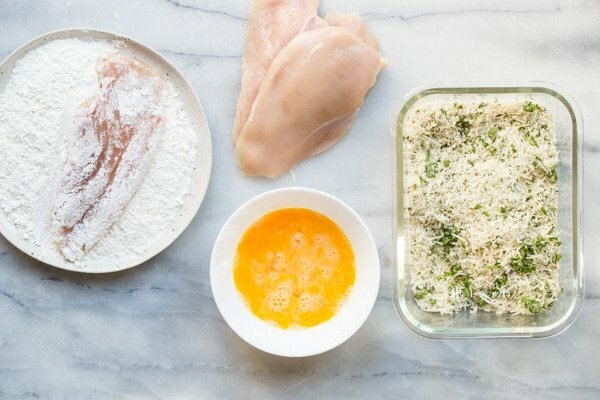 How do you make Chicken Milanese? First, you want to butterfly the chicken breasts by slicing them to get two flat pieces of breast. 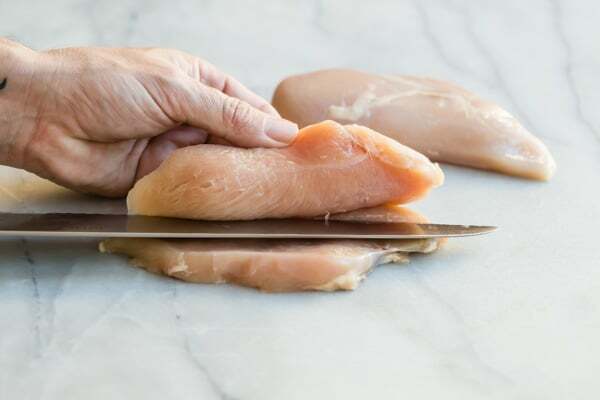 Using a sharp chef’s knife, slice each chicken breast horizontally through the middle. Then sandwich them between two pieces of plastic wrap (this cuts down on the mess) and gently pound the breasts into evenly flat cutlets. This step ensures the chicken cooks like a dream. Then you need three bowls: one for flour, one for the egg mixture, and one to hold the Parmesan breadcrumbs. One at a time, dredge the chicken into the flour, then into the egg, and finally into the breadcrumb mixture. Not ready to cook just yet? That’s okay. At this point, you can stack the breaded cutlets on a plate and slip them into the refrigerator to cook later in the day. When ready to cook, heat the oil in a shallow pan and carefully lower the cutlets into the oil, Don’t crowd the pan. Cook the chicken about three minutes per side, until the breadcrumbs are golden brown. Remove the cutlets and let drain on a paper towel-lined rack, and keep in a warm (200 degrees) oven until ready to eat. Finally, making the arugula salad is a cinch. 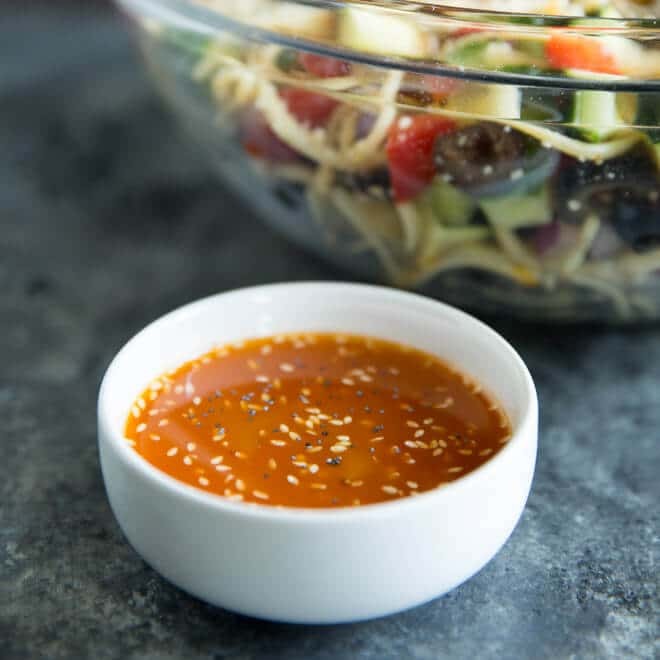 It’s dressed in a quick vinaigrette and placed on top or alongside the chicken with a little extra Parmesan cheese to seal the deal. How many calories in Chicken Milanese depends on how large your portions are and how much cheese you use. I do include nutritional information below the recipe. As it stands, each serving is around 500 calories. Can you make Chicken Milanese without cheese? You absolutely can. Just omit the cheese, but add a little more salt to the chicken breading mixture. 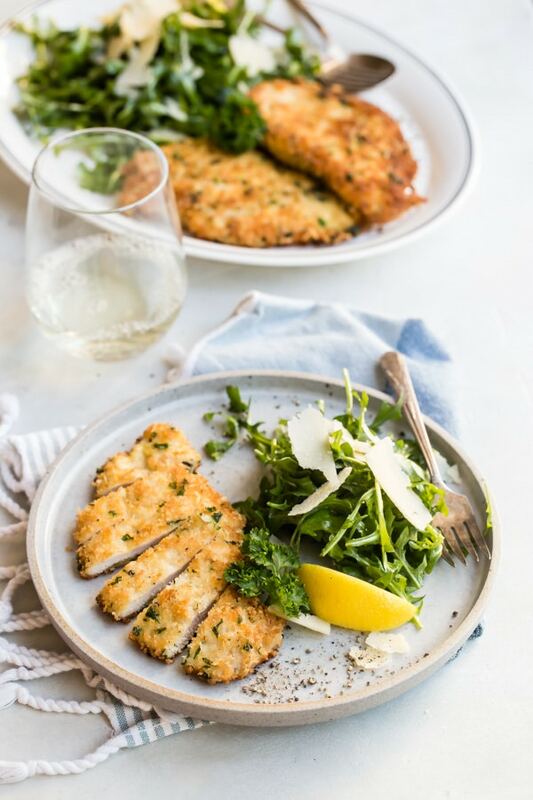 Can you make Chicken Milanese in the air fryer? If you’re excited about your new air fryer, breaded chicken cutlets are delicious cooked in the Air Fryer. 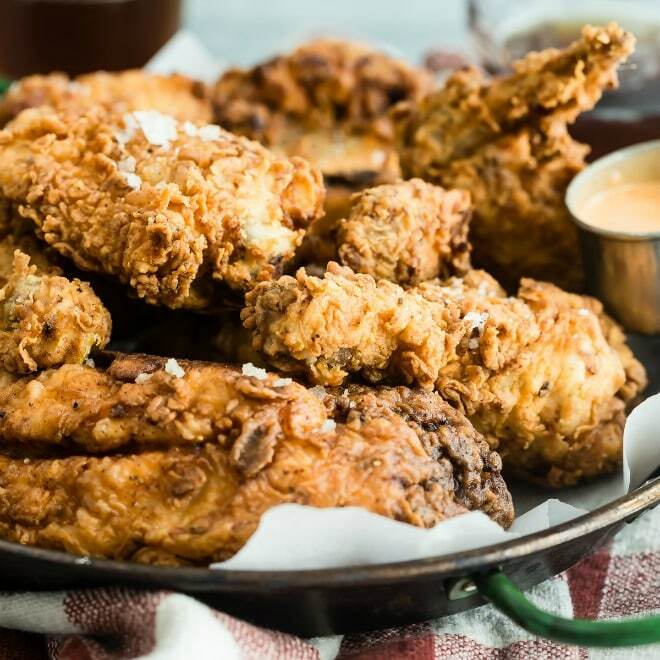 Here’s how: set your fryer to 390 degrees and cook for 10 minutes, then turn the chicken over and cook at 300 for another 10 minutes. Keep an eye on them—different appliances may cook things differently. Lucky you–you have leftovers! In that case, gently reheat any leftovers and serve on a simple pasta. Or toss strips of chicken into a larger arugula salad with tomatoes, red onions, and Parmesan. Or make the best mashed potatoes ever and serve a warmed cutlet on top. And don’t forget to let me know what time dinner is! Preheat oven to 200 degrees. Line a rimmed baking sheet with foil for easy cleanup. Top with a wire rack coated with nonstick spray or olive oil. 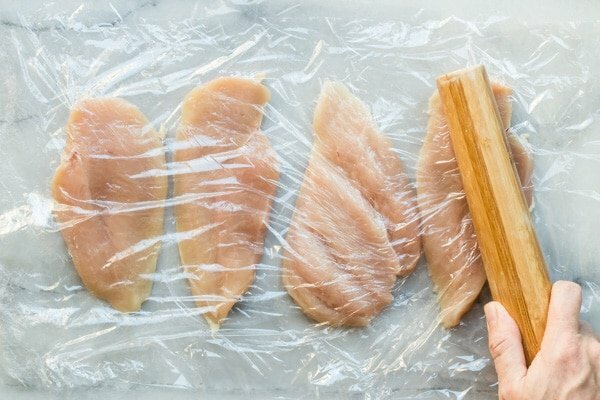 Cover a cutting board completely with a piece of plastic wrap. Add chicken breasts. Working with one breast at a time, place your palm on top of the breast and slice in half horizontally so you have two cutlets. Repeat with the second breast. Arrange all four cutlets in a single layer on the plastic wrap-covered cutting board. Cover with a second piece of plastic wrap. Pound chicken breasts to an even thickness, about 1/4-inch. Remove top layer of plastic wrap and season breasts with salt and pepper. In a shallow dish, add flour. In a second shallow dish, add eggs and beat lightly. 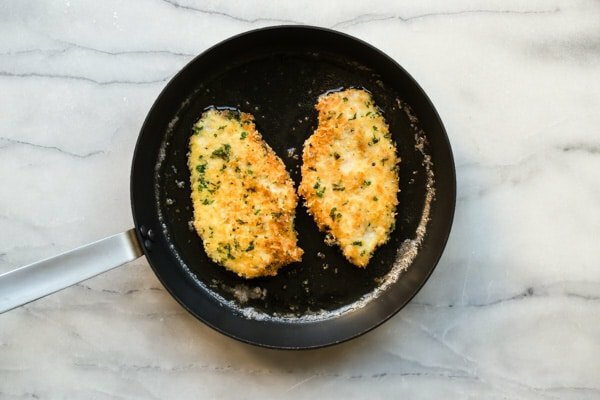 In a third shallow dish, combine panko, grated Parmesan, parsley, lemon zest, 1/2 teaspoon salt, and 1/2 teaspoon pepper. Stir to combine. Working with one cutlet at a tie, dredge in flour and shake off excess. Dip in eggs and tap gently on side of dish to remove excess. Add to panko mixture and press gently until crumbs adhere. Transfer to a large plate and repeat with remaining cutlets (cutlets can be wrapped in plastic and refrigerated for up to 2 hours). Line rimmed baking sheet or large plate with 3 layers of paper towels. In a large skillet over medium-high heat, heat remaining 1 cup oil until shimmering. Add 2 cutlets and fry until deep golden brown and cooked through, about 3 minutes per side. Drain cutlets well on paper towel-lined plate and transfer to prepared wire rack in oven to keep warm. Repeat with remaining 2 cutlets. In a small bowl, whisk together olive oil and lemon juice. Season to taste with salt and pepper. Set aside. Gently toss arugula salad with vinaigrette and shaved Parmesan. Serve chicken with salad, passing lemon wedges separately.